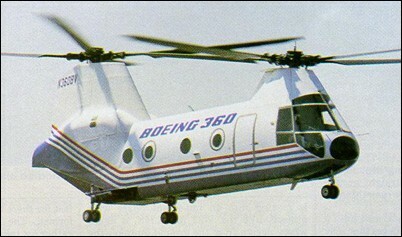 First flown on 10 June 1987, the Model 360 is a privately developed advanced technology rotorcraft, designed to research the company's other rotorcraft programs. The helicopter features advanced aerodynamics and extensive use of composite materials including the fuselage, rotor shafts, blades and hubs. Powered by twin Avco-Lycoming AL5512 engines (4200shp) the Model 360 has a 370km/h cruise speed. The aircraft's advanced cockpit features cathode ray tube displays, multi-function callouts, digital automatic flight control system and other improvements to reduce pilot workload. Only one model 360 was built (N360BV).